Dilma Rousseff Is Out After Brazil's Senate Votes To Impeach Her : The Two-Way The suspended president testified for 14 hours straight on Monday, and 66 senators gave speeches in a marathon session that stretched through the night. Then they approved the impeachment, 61 to 20. Suspended Brazilian President Dilma Rousseff testifies on the Senate floor during her impeachment trial Monday in Brasilia, Brazil. On Wednesday morning, Brazil's Senate voted to impeach suspended President Dilma Rousseff. Interim President Michel Temer was then sworn in as president. 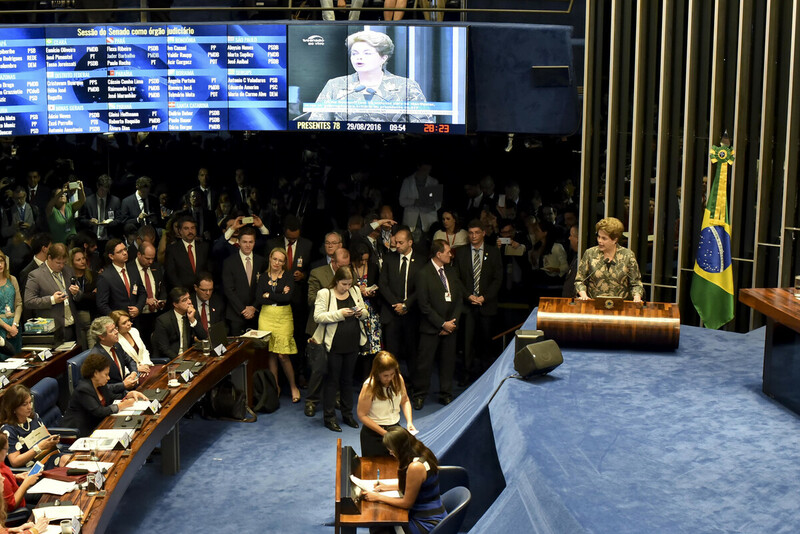 Sixty-one senators voted in favor of removing Rousseff from the presidency; 20 voted against her impeachment. Rousseff is accused of mishandling Brazil's budget and misrepresenting the state of the economy. Some of her accusers, as Rousseff noted in her testimony, are themselves accused or convicted of serious corruption charges. She testified for 14 hours straight on Monday, NPR's Lulu Garcia-Navarro reports. Rousseff defended her innocence and characterized the impeachment as a coup. Some 66 senators took the floor during the proceedings to question her or deliver speeches, in a marathon session that lasted through the night. Emotions ran high, Lulu reports: "There was this surreal moment, where one of the prosecutors, Jenaina Paschoal, who was advocating Rousseff's impeachment — she burst into tears in her closing argument. She asked for Rousseff's forgiveness because she did not mean to cause Rousseff pain," Lulu says. "She was not alone in her tears," Lulu says. "The defense lawyer Jose Eduardo Cardozo also wept openly after giving his defense." Rousseff's impeachment was expected to bar her from office of any kind for the next eight years. But the Brazilian senate actually held a second vote on that issue, and — 42 in favor, 36 against — failed to reach the necessary votes to pass the ban. That means Rousseff has the right to run for office again. Rousseff could, and likely will, appeal to Brazil's highest court, The Associated Press reports. "But previous appeals during the process have failed," the wire service says. The suspended president has previously said that, if and when she's removed from office, she'll retire to her home in the city of Porto Alegre in southern Brazil, Lulu reports.